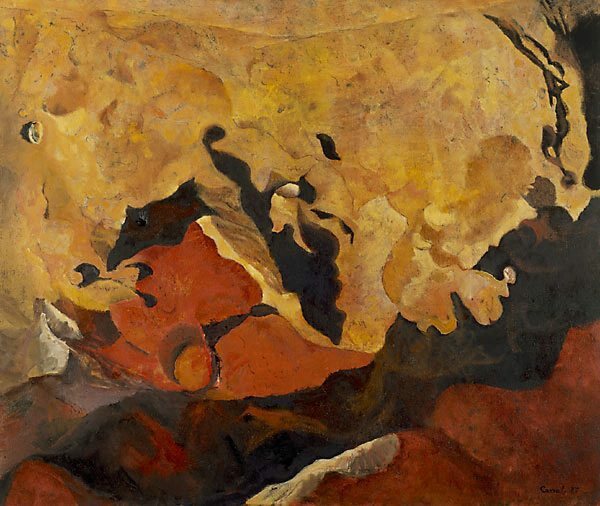 Leap belongs to a sustained series of paintings from the mid 1980s that developed from drawings and watercolours Cassab made of the desert landscape. In this major painting, fragments of the charcoal underdrawing appear through the colourful surface of oil paint. Apart from giving an indication of how the painting was made and adding depth to the image, it reveals the absolutely fundametal role drawing has for Cassab’s paintings of the outback. Signed and dated l.r. corner, black oil "Cassab 85". Anne Loxley, Art and Australia (Vol. 30, No. 4) , 'Impressions of a new land - Judy Cassab and Stanislaus Rapotec interviewed', pg. 521-524, Sydney, Winter 1993, 521 (colour illus. ), 522. Elywn Lynn., Good Weekend Magazine , 'Review', Sydney, 20 Apr 1985-21 Apr 1985, 10. Barry Pearce, Australian art: in the Art Gallery of New South Wales , 'Earth and paradise', pg. 283-284, Sydney, 2000, 285 (colour illus. ), 300. Anne Ryan, Look , 'Judy Cassab's landscapes: Celebrating her adventurous spirit', pg. 16-17, Sydney, Jul 2008, 17 (colour illus.). Various, The New Oxford Book of Australian Verse , Melbourne, 1996, cover (colour illus.). AGNSW Collections , 'From Colonialism to late Modernism', pg. 7-106, Sydney, 1994, 53 (colour illus. ).